STATE IMPACT PENNSYLVANIA – Last month, Pennsylvania saw the most recorded rainfall in a July. For many farmers in the state, the intense precipitation is part of a pattern of weather changes they are trying to adapt to. Study co-author Heather Karsten, associate professor of crop production ecology and the Department of Plant Science at Penn State, said more extremely hot days in the late summer are expected over the next 50 years. 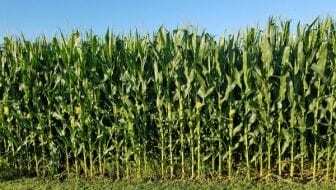 Without changes to farming practices, Karsten said this will reduce the corn yield in the Lancaster County area, which would hurt Pennsylvania’s dairy industry, where corn is a major feed for cows. “Farmers will likely need to adapt. In some regions, farmers may actually want to resort to irrigation,” she said. Irrigation is a method widely used in the Midwestern part of the country, and Karsten says the projections suggest Pennsylvania farmers might have to start considering this practice. But in reality, farmers are already adapting to some changing weather patterns. With bursts of intense rainfall taking place more frequently, researchers say farmers are being forced to add more cover crops to protect the soil against erosion. Franklin Egan, the education director with the Pennsylvania Association for Sustainable Agriculture, says that’s a smart move – though it’s costly. “That would be a really significant cost in terms of revenue – several thousand dollars or more per acre,” Egan said. According to Egan, since 1950, the total rainfall in Pennsylvania increased around ten percent, but the frequency of extreme wet weather – meaning more than an inch of rain in a 24-hour period – increased by nearly 50 percent. “That means farmers are kind of dealing with this paradox of too much rain in some periods of the year and often with short term but pretty intensive droughts,” he said. That’s worrisome because the heavy rainfall could easily wash away organic matter in the soil, damaging its health and productivity. It’s a difficult new pattern to adapt to, Egan said, but farmers are coming up with new ways to handle the change. In addition to adding cover crops, some also shift from dry hay to silage to keep feed last longer. In the long run, Egan said, these practices, such as protecting soil health, will make farming in Pennsylvania more resilient and sustainable.